yeah that could be problematic! 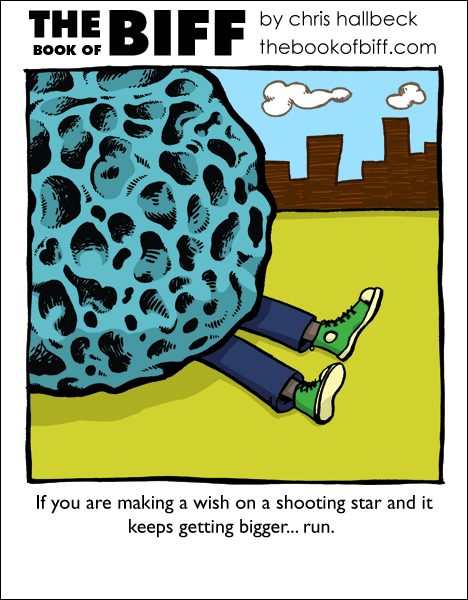 Or just wish not to get hit by it! shhh Tkort! wishes dont come true if you tell them! obviously biff said his wish outloud and someone nearby heard him….shame. Biff’s got some sweet chucks. XD That’s the first time I’ve actually noticed them. Um… shouldn’t the meteor be on first? or like, in a crater? It kind of looks like gray cheese where it is… =P still funny, though. Physics don’t apply in Biffs world, as can be found from sideways gravity. Since when can he speak? He can speak. Chris is just far too lazy to draw words, too. So he’s speaking, you just can’t “hear” him. When you wish upon a falling star, your dreams can come true. Unless it’s really a meteorite hurtling to the Earth which will destroy all life. Then you’re pretty much hosed no matter what you wish for. Unless it’s death by meteor. Oddly Frozen- I think you mean #106. #107 is Dirt. What did he wish for? when you wish upon a star, your wishes can come true. unless it’s a meteor sent to destroy a life. either way, your pretty much hosed. unless you wish for death by meteor. It looked like a brain to me. Flying brains crashing into Biff is pretty darned funny. I’m a nerd, I figured blue star with lots of sunspots. But yes, flying brains of doom are much funnier. thanx for the advice Biff! it reminds me of those old print ads for migraine medication, you know, like in Readers Digest. I remember this was the first comic i ever read when i first saw the Book of Biff. Lol loved it. Great job Chris! Does that mean he has SUPAH POWAS? I love his green shoes! !